It was late evening on 8th of November - usual weekday coming to end and I had just returned from a hectic day at work. I had parked my car in the garage, took the stairs to burn those few calories and settled in the Sofa. Wifey had my coffee ready and we were sipping onto the steaming drink, which felt platonic in the mild chill of the winters that had started setting in. We had planned to be on television later that night as results for Presidential elections were to be announced and the entire world was waiting with bated breath on who out of Hillary Clinton or Donald Trump would be notionally most powerful person of the free world. Well for the moment, life was perfect but how long could it continue. A phone call asks us to put the television on - apparently, Prime Minister Modi was in middle of his address to the nation. A few minutes later, we were rushing out of the house to the society's ATM machine. The Prime Minister had announced that the highest denomination currency in the country (bills of Rs. 1000 and Rs. 500) have been legally withdrawn and new currency bills had been introduced. Restrictions on banking operations were announced to temporarily regulate the cash withdrawal and circulation in the country. Now there were various reasons for why the step was taken and we would get into the details in a bit. However, the emergent action needed was to source some cash into the house as all we had was in denominations of 500 and we needed some money to carry on the life for a few weeks until the dust settled and banks revived to normal operations. So, there we were at ATM, within about half an hour of Prime Minister's announcement. We weren't alone and had almost a dozen people in the line outside the ATM. The atmosphere there was no less than electric. Everyone had some or the other views on the decisions - some were astonished, others were admiring the PM on his courage, some were humored and some were simply having fun enjoying the memes that filled the social media world. Well, whatever they felt, none was critical about the decision at that point. People thought the problem was temporary and based on the speech of the Prime Minister, the worst was to be over in two weeks time. We soon were a part of banter too and if nothing else, that wait did prove to be a great networking opportunity. During that hour and a half's lineup, we met made new friends in the society and that itself was a by-product worth the effort. The line moved rather slowly but steadily - slow because you had to withdraw money in batches of 400 bucks each. Why? That is because the machines were still calibrated and filled in to dispense the bigger denominations - the ones being de-legalized in another 4 hours. Of course, the first few attemptees made the mistake and had a couple more of the undesired currency that they already had. On top of this the same attempt to withdraw cash was being repeated at each ATM and hence the servers were worked over their capacity to support the ATM operations. Our turn came and we got ourselves about 2400 bucks across three cards - enough to suffice for cash expenses over a couple of weeks. We went to a peaceful night of sleep after that. But we were not the only ones. Consider two of my friends below and wonder how their night went by. In the spirit of not disclosing names, one of my friend ABC boarded his train on the evening of November 9th from Delhi for a quick visit to the hill in Himachal Pradesh. He was happy that he was taking his family for a vacation after all this while and they had planned well. They had everything they needed for the visit packed nicely including the money they were about to spend. Little did they knew that the money they had wasn't worth a penny by the time they were de-boarding the train at 4 in the morning. He got down at the station, found his way out and tried to hire a rickshaw. The only problem, the rickshaw guy wanted to be paid - and in a legal way. He managed the situation with coins coming out of his wife's wallet but then, he took the next train available to be back in Delhi. He couldn't have traveled the remote parts of the country where digital payments are still a mirage. Now, this another guy, XYZ, He did not have a way to return home even. He had his marriage scheduled on 16th of November, exactly about a week from the announcement. Now if someone knows how Indian weddings go, they would agree that they are an extravagant affair by any standards, There are hundreds of vendors and each needs payments in cash. And overnight, all the cash he had was defunct. As soon as he heard the news, he was lost in deciding whether to look for a way around this or to just postpone his wedding. For next week and a half, the groom was standing in lines from dawn to dusk, trying to gather whatever he could from the banks. Just keep these two guys and the night they spent immediately after the announcement as you read through this article. Anyways, two weeks passed by quickly. Banks were closed for a couple of days to prepare themselves for the operational changes. Re-calibrating ATM was apparently a complex process which wasn't considered earlier and hence most machines were out of operation and hence branches were the only way to obtain money. There were huge lines across all banks and their branches with people lining up to deposit their now defunct currency and looking to withdraw money for their day-to-day expenses. While former was possible if you had the patience, but the withdrawal was a tricky aspect as the supply of money was a bottleneck. For us, while most payments were anyway undertaken digitally, the 2400 bucks sufficed for our cash payments and we managed those two weeks comfortably. What transpired behind the scenes leading up to the announcement? It is easy to understand, even for a layman like me that if this had to succeed, the foundational requirement was SECRECY. The initiative started with that word and had to be on that word until it was announced on the eventful evening of November 8th. The primary goal that the government had set behind the decision was to curb black money and any leak would have tipped off unaccounted cash holders and they would have to some extent managed to siphon off their holdings. However, one cannot help wonder that how could an organization with insincere image and unprofessional outlook pull up such a humongous step with such precision. I am sure it needed countless meetings, continual discussions, mammoth analysis and innumerable individuals involved in the process. And, on that note, I would definitely like to send cheers to the entire team involved in maintaining a hush-hush voice through the entire process. So, what was being done behind the scenes when most of us were not even imagining of something like this. It all started in the starting of 2016 when someone injected this idea into the mind of Prime Minister Modi - a select special group of advisers brought up the issue in a random meeting and it caught his fancy. It had been almost over a year until then that Modi had been behind the research on how to give tooth to the government's fight against black money and had involved officials from the finance ministry, think tank organizations and RBI. Each of them had their own perspective but none of the recommendations until this were as convincing and as game-changing as this one. Now, even to think about it was dramatic in itself and everyone realized that even thinking through this idea needed perfect planning. It was decided that the loop would be kept tight on this and PM Modi pulled in only a countable number of officials from the Prime Minister's Office (PMO), Finance Ministry (FinMin) and Reserve Bank of India (RBI). 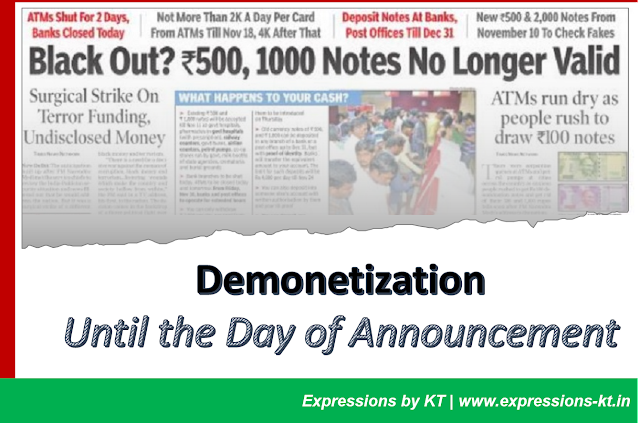 The team was asked to find answers to most basic questions to start with - What would be the benefits of demonetization? Who would benefit from this? How quickly can the new currency be printed? How would it be distributed? How would the defunct currency brought in? How will deposits be tracked? Each of these questions was broken down and assigned to different groups to prevent anyone from joining the dots and concluding that a cash swap was in the offing. This continued for next five months and the officials juggled through various research sources and came up with various scenarios for each of those questions. It was now time to bring all this data together and take a formal approach if it was to be implemented. During an intense meeting of the PMO and finance ministry officials in May 2016, the PM walks in the room to observe the progress and lends his voice to the process - he announced that he was convinced that this was the way to go and gave his go-ahead for the biggest monetary reform of independent India. A broad plan was finalized in that meeting and a team put up to take the country through this mammoth task. 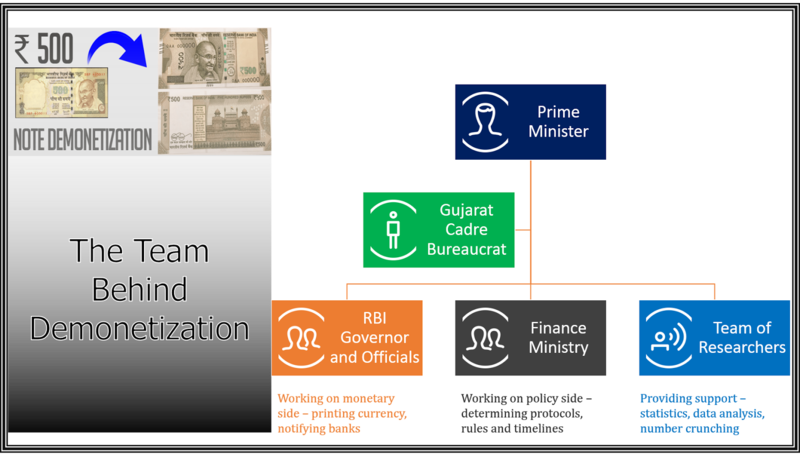 The empowered team with this responsibility was limited in terms of people involved and the size was restricted to about 10 officials - including RBI governor Urijit Patel, Secretary of Economic Affairs Shaktikanta Das, Secretary of Investments & Currency Dr. Saurabh Garg, official in PMO Hasmukh Adhia and five others from various units. 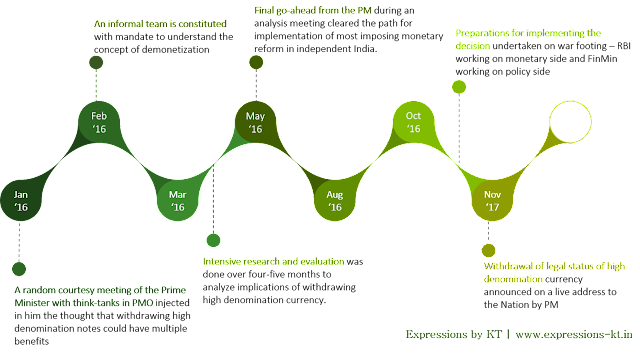 The team was to be supported by a small team of young researchers who were otherwise involved with managing social media analytics for the PMO. The selection was based on the trust that these individuals enjoyed with the PM. The entire team was sworn to utmost secrecy before on-boarding them on the initiative. This was when the race against time started for the team. In order to manage confidentiality, it was decided that most discussions and reports would be verbal and unofficial in nature, to the extent possible. As soon as the decision was made, each entity began in preparing itself for accomplishing their part. A major role in all this was to be played by the RBI. The RBI Governor coordinated activities within RBI and managed covert operations there. First was to get the replacement currency ready before the actual date of the announcement. The printing presses of RBI - Bharatiya Reserve Bank Note Mudran Private Limited (BRBNMPL) and Security Printing and Minting Corporation of India Ltd.(SPMCIL) - got their machines cranking and started operating at their maximum capacity. The two presses had two specified tasks announced independently - one was to print the new currency of Rs 500 and Rs 2000 denominations and other was to print the lower denomination currency. The printing of the currency, to be defunct, was stopped. As and when the currency was ready, the supply of lower denomination was beefed up to various currency chests across the country. RBI issued a notification on May 5 to all the banks to re-calibrate their ATMs to dispense more of Rs 100 notes compared to the higher denomination. While an official notification was issued, RBI was hesitant in pulling too many levers in fear of spilling the beans. On their part, most banks ignored the notification and those who obliged restricted their obedience to a few of their network ATMs. For instance, State Bank of India (SBI) configured one ATM in each district to shell out only 100 rupees notes. During this entire process, the actual reason for the exercise was kept under wraps with even the heads of biggest banks of the country unaware of what was about to come. The other site of hectic activities was the Prime Minister's residence at 7 Lok Kalyan Marg (read more about PM's residence at The PM House - 7RCR: Elite Residence - Power Center) which was made the camp site for this initiative. The team of researchers operated from here and most of the meetings were held in the offices attached to the residence. Prime Minister and his office kept a close watch on the progress of implementation. Prime Minister's confidante bureaucrat Hasmukh Adhia kept tabs on the day to day activities and reported daily. The finance ministry officials drew and elaborate plan on handling various stakeholders and tactical operations once the announcement was made. The officials were aware that this was being done for the first time and no one had enough experience to plan everything to the tee. However, they drew up various scenarios which could evolve and came up with a strategic and tactical plan for potential eventualities. This continued for about six months and officials were still struggling to figure out the modalities of the announcement. Initially, the plan was to make the announcement in the later part of the November however, there was a belief that a part of the plan may have leaked in some sections. Some newspapers carried news articles about new currency being printed. Actually, pictures from one of the batch of new 2000 rupees notes were taken at one of the printing presses and surfaced in social media. Though this wasn't interpreted as a part of banning of old currency but some sections of media carried articles speculating that something like this could happen. When these reports reached the war-room, officials knew that they had to advance the announcement to pre-empt any action among the public which could nullify any benefits from demonetization. So, after consulting stakeholders, November 8 was decided to be the D-day. Now what happened on the D-day, November 8th of 2016, is another story in itself. A well choreographed set of events occurred in tandem to ensure the secrecy until the PM himself brought this to the nation. Read all about it in the next article.